Visit a locality browsing the menu on the left. In each Italy area you can then choose the best touristical structures we are proposing. La Pasticceria De Riso - De Riso Confectionary- is located in Minori, just opposite the seafront and a few steps further St. Trofimena's Cathedral. 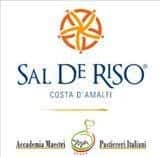 It is the confectionary par excellence of the Amalfi coast thanks to the quality and quantity of cakes and pastries made by Salvatore De Riso, well known for his talent and genius. When you enter the confectionary you feel almost overwhelmed with a riot of colours and flavours: a "sweet" enhancement of the local products . The famous "delizia al limone" and the "ricotta e pere" have been invented here! On a fresh July evening, we have tasted a slice of "Scazzetta del vescovo" (sponge cake soaked in "Strega Alberti" liqueur, custard and strawberries, frosted with strawberry sauce) and "Millefrolle romana" (sponge cake, Giffoni hazelnut short pastry, ricotta cheese with whipped cream and hazelnuts). To drink, a glass of Passito di Pantelleria wine suggested by Alessandro De Riso to exalt the flavour of the strawberry sauce ("Scazzetta del vescovo") and the deliciousness and simplicity of the "Millefrolle romana"! Only a suggestion: choose what most strike your sight and don't worry about fat and calories. Salvatore De Riso's cakes are simply delicious and a pleasure to look at and! Fall into temptation without regrets! Web Engine v4.0b1 - Copyright © 2008-2019 Locali d'autore S.r.l. - C.so Reginna 108 - 84010 Maiori (SA) - REA 379240 - VAT ID IT04599690650 - Capitale Sociale Euro 100.000 i.v.